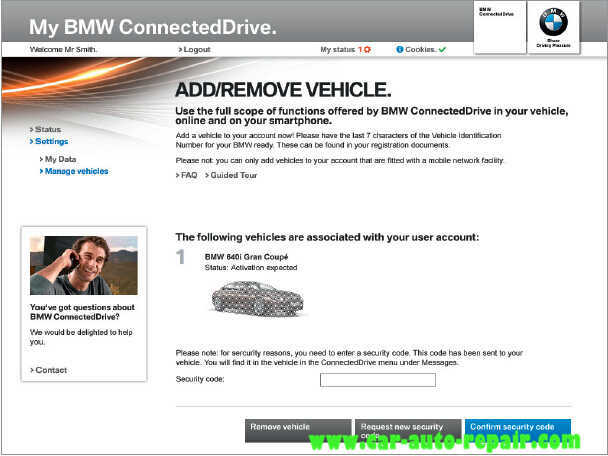 Home » How To » How to Register and Use BMW ConnectedDrive? BMW ConnectedDrive integrates your BMW’s intelligent interfaces, your smartphone, and other technologies to keep you aware and in control of everything going on both in your vehicle and your day-to-day life.BMW ConnectedDrive allows you to control ConnectedDrive features from your iPhone — everything from unearthing countless radio stations to saving directions to that new taco joint you’ve wanted to try. You can create customizable news stations with Stitcher and music destinations with Pandora. The system can even read Facebook and Twitter feeds out loud (no peeking at your phone required). You can get free about 3 year,and after which you need to pay $199/yr for Safety and $398/yr for Safety and Convenience. 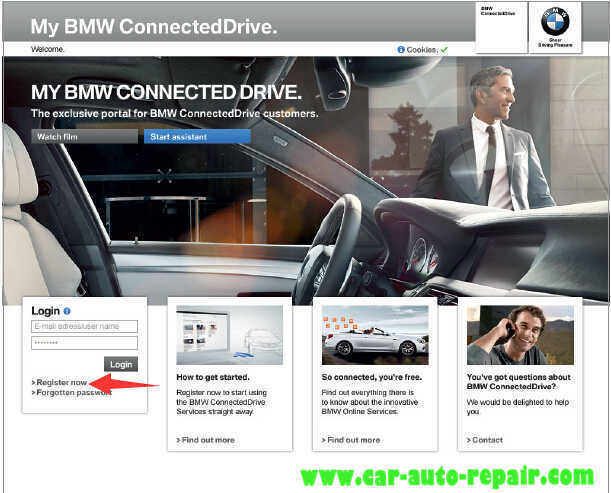 How to Register BMW ConnectedDrive? 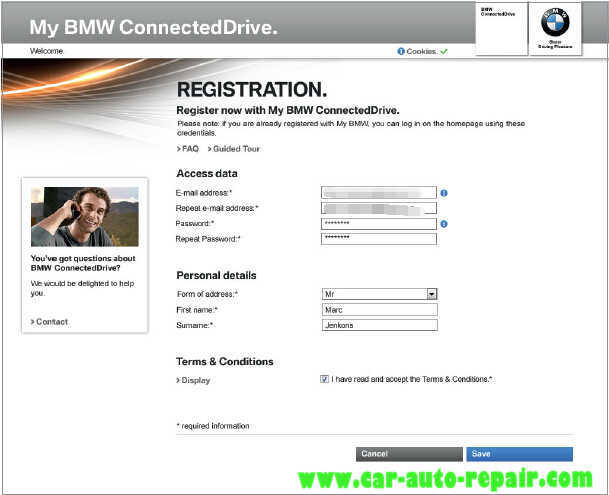 You have to go online and register both yourself and your vehicle on the ‘My BMW ConnectedDrive’ customer portal in order to be able to use some of the functions. After logging into a password-protected area, personal and vehicle-related settings can easily be managed, such as activating the remote-control function or configuring the email account for BMW Online Office. Step 1:On the home page of the ‘My BMW ConnectedDrive’ customer portal at www.bmw-connecteddrive.com, go to ‘Register now’. Step 2:Now enter your email address and name, then choose a password and accept the terms and conditions. Step 3:A confirmation email will then be sent to the address you entered. Click on the link in the email to confirm your registration on the portal. Step 4:You can now log into the customer portal and link your personal BMW with your account under ‘Add vehicle’ by entering the VIN (last seven digits of the chassis number) and optionally providing the license plate. Step 5:A security code for activating your vehicle will then be sent to your personal BMW. Enter this code in the customer portal to complete the registration process. Q1:Why have I not received a registration confirmation e-mail? A1:In individual cases, there may be delays sending out the registration confirmation e-mail. If you do not receive a confirmation e-mail within 24 hours, please register again or contact BMW Assist, toll-free, at 1-888-333-6118. Q2:Why can’t I complete the registration without confirming the “Terms and Conditions”? 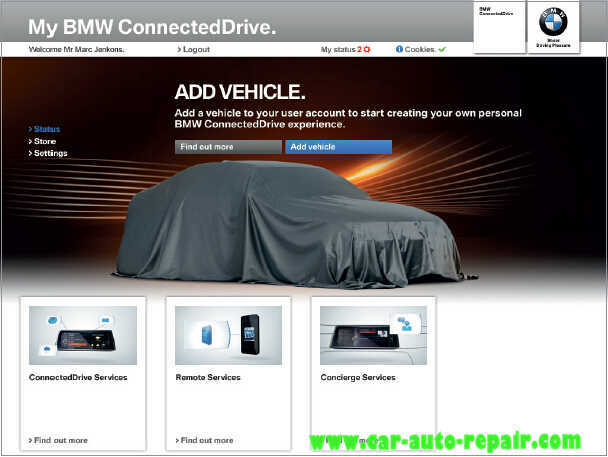 How to Use BMW ConnectedDrive? 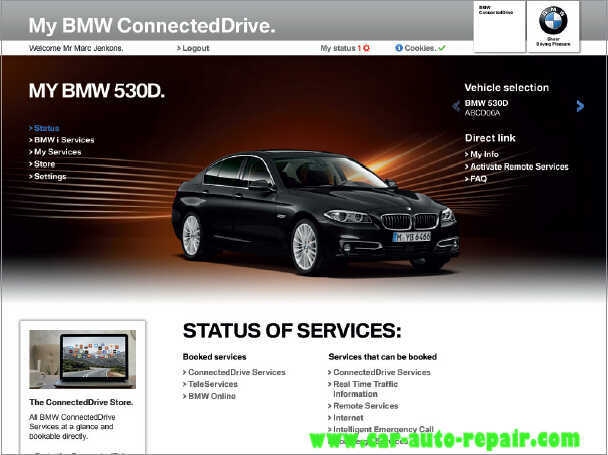 Step 1:Your vehicle and a list of all the BMW ConnectedDrive services purchased are displayed in the ‘Status’ menu. 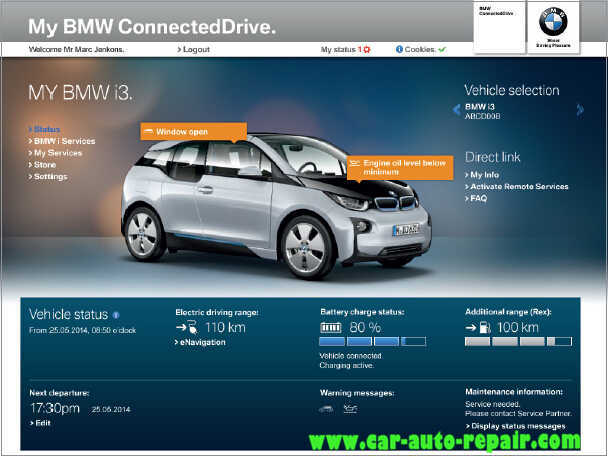 Step 2:BMW i owners can also see the battery status, range and other status information here. 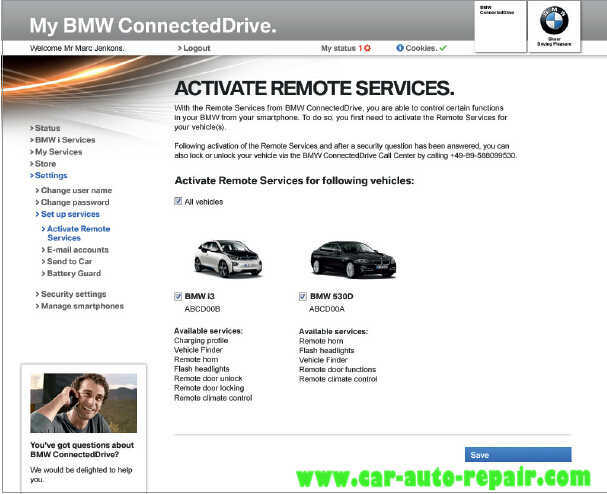 Step 3:You can activate the My BMW Remote App or BMW i Remote App for your BMW by clicking on ‘Activate Remote Services’ in the Status menu or by going to ‘Settings – Set up services – Activate Remote Services’. Step 4:You can use the ‘My info’ service located in the ‘My Services’ menu to send data such as messages, addresses, email addresses and telephone numbers to your BMW. 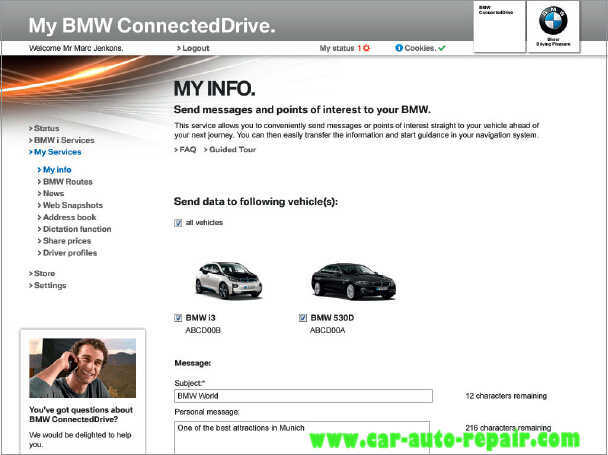 To access ‘My info’ in your BMW,got to the ‘ConnectedDrive’ main menu and select ‘Messages’. Step 5:Got to ‘Settings–Set up services – Email accounts’ to configure your email address and create text blocks for sending emails quickly and easily during the journey. Step 6:You can go to ‘Settings – Set up services – Battery Guard’ and set the Battery Guard feature to inform you by text or email as soon as your battery reaches a critical charge level. 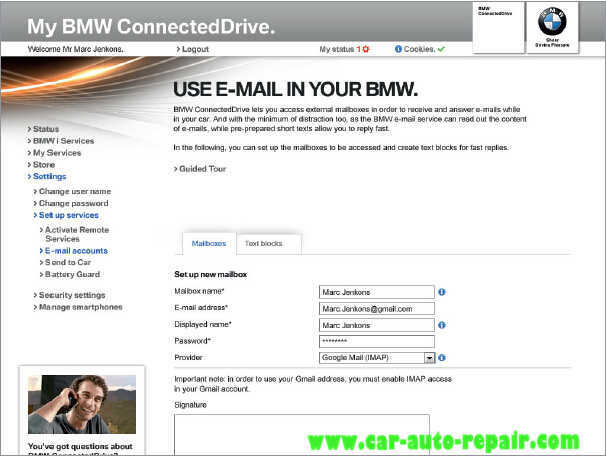 From Auto Repair Technician Home, post How to Register and Use BMW ConnectedDrive?